Navigating your way through Australia’s immigration process can be daunting. We will provide you with accurate and ethical advice about your chances of success. We provide you with options so that you can make an informed decision about how you wish to proceed. The benefit of our approach is that you remain in control of the process at all times. Meticus is focused on providing a highly individualised and personalised service. Our lawyers take the time to explain the immigration process to you. Whether you are in Australia or abroad, you can talk to one of our lawyers directly and as often as you need to. We understand that you want the best possible service and value for your money. Meticus delivers timely results in a cost effective manner to our clients. We work hard to gain that trust and are proud of the reputation we have earned as a results-driven and ethical business. If we think you are not going to be successful we let you know. We do the right thing by our clients and our business grows when our clients recommend us to others. Penny Dimopoulos started her legal career as a criminal lawyer with a well established criminal law firm in Melbourne. 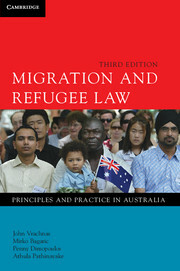 Her strong interest in Australia’s immigration and refugee policies led her to focus predominantly on immigration law. She set up a successful immigration practice within the criminal law firm she was employed at and then went on to establish her own migration business. Penny has been employed as an assistant lecturer at Monash university and is the co-author of two of Australia’s leading texts on immigration law. Penny speaks English and Greek. Emily Chinnappa started her career as a graduate lawyer with Meticus Lawyers in 2016. Prior to this, she worked as chief of staff for a Federal Member of Parliament. Emily has also worked as a researcher in the university sector. Emily has experience in working with government Departments and liaising with both the private and public sector. She has an interest in politics and international relations. Emily is an effective communicator and committed to finding solutions for clients.